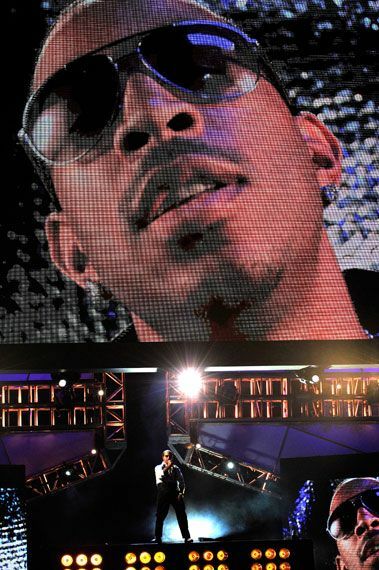 Ludacris is seen on the big screen as Les Grossman asks him to "drop a beat" he can get down to! And boy, does he ever! Les Grossman takes the stage to get down with none other than Jennifer Lopez! Even Jennifer Lopez can't resist the charm of "Tropic Thunder" star Tom Cruise decked out as his infamous character Les Grossman. It wasn't just Les Grossman and Jennifer Lopez out there dancing -- they brought a whole entourage of backup dancers to help them out! With an assist from Louda [who dropped the beat at Les' request], Jennifer Lopez and Les Grossman get down in an epic dance battle at the 2010 MTV Movie Awards. "Twilight: New Moon" star Kristen Stewart accepts her award for Best Female Performance and keeps her acceptance speech short and sweet, telling the audience "I guess you think 'Twilight' is really awesome -- and I agree!" 2010 MTV Movie Award host Aziz Ansari kicks off this year's show with a diatribe about 2D vrs 3D film, his love for Edward from "Twilight" and how weird James Cameron's pitch for "Avatar" would sound out of context. Ed Helms takes to the piano to sing "Stu's Song" from "The Hangover" as Ken Jeong performs an interpretive dance at the 2010 MTV Movie Awards. "The Hangover" stars Ed Helms and Ken Jeong do a little song and dance at the 2010 MTV Movie Awards. "Hangover" star Kim Jeong shows off his bikini wax while serenading the audience at the 2010 "MTV Movie Awards" with a song about the power movie music. "Hangover" stars Ken Jeong and Ed Helms delight and disturb the 2010 "MTV Movie Awards" audience with a song about the power of movie music. Robert Pattinson, Kristen Stewart and Taylor Lautner present a brand new clip for their third forthcoming franchise film, "Twilight: Eclipse," in theatres June 30th. Kristen Stewart and Robert Pattinson celebrate the win for best kiss at the 2010 "MTV Movie Awards." Robert Pattinson and Kristen Stewart accept their award for Best Kiss for "Twilight: New Moon" by trying to replicate their on-screen chemistry. As you can see here, issues ensue! Zac Efron laughs through a kiss with girlfriend Vanessa Hudgens after they're the first couple caught on the Kiss Cam at the 2010 MTV Movie Awards. Faced with the Kiss Cam, Snowboarding superstar Shaun White lays a wet one of his date at the 2010 MTV Movie Awards. Jonah Hill and Russell Brand see themselves on the 2010 "MTV Movie Awards" Kiss Cam and realize what must be done. A Kiss Cam was a nice addition to this year's Best Kiss award presentation and "Get Him to the Greek" stars Jonah Hill and Russell Brand make a nice couple, yes? Jonah Hill and Russell Brand embrace the spirit of the Kiss Cam and each other on the 2010 "MTV Movie Awards." Clark Duke forces himself on "Jersey Shore" star The Situation's date. Oops? The Situation later chases him out of the room. Clark Duke apologizes to "Jersey Shore" star the Situation after putting the moves on his lady friend during the Kiss Cam at the 2010 MTV Movie Awards. Katy Perry gives a shout out to all the left-coast ladies during her performance of "California Gurls" on the 2010 "MTV Movie Awards." Katy Perry rocks a glowing bodice for her performance of "California Gurls" at the 2010 "MTV Movie Awards." Katy Perry and Snoop Dogg remind folks at the 2010 "MTV Movie Awards" of west coast rap's gifts to the world during the performance of "California Gurls." With fiancée Russell Brand looking on, Katy Perry performed her hit single "California Gurls" with Snoop Dogg at the 2010 MTV Movie Awards. Snoop Dogg serenades Katy Perry at the 2010 "MTV Movie Awards" during the performance of "California Gurls." Katy Perry's love of "California Gurls" cannot be contained at the 2010 "MTV Movie Awards." 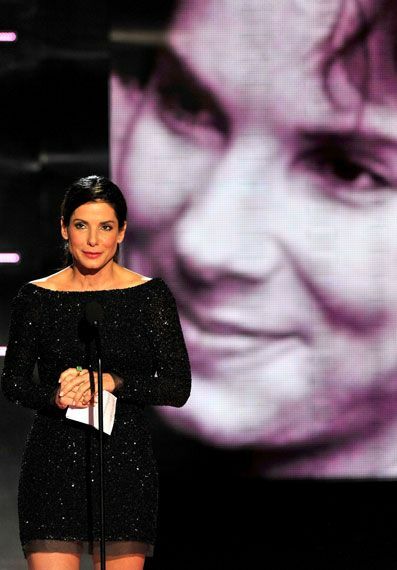 Sandra Bullock accepts her MTV Generation Award by telling the audience "I love what I do and I'm not going anywhere!" Sandra Bullock thanks the 2010 "MTV Movie Awards" audience for the standing ovation and then reminds them that show must remain on schedule. 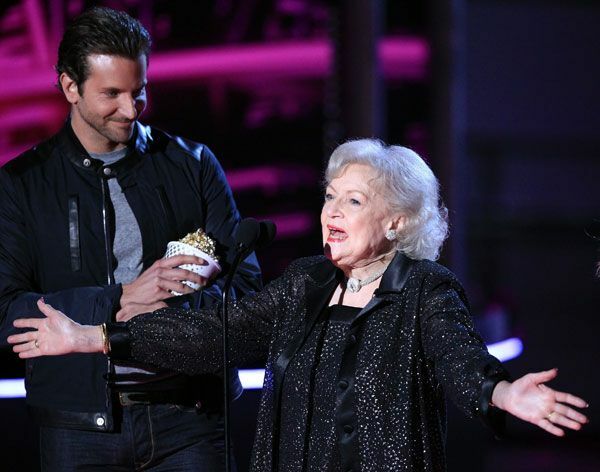 Bradley Cooper and Betty White, who calls her "Proposal" co-star "a national treasure" and says she "adores her madly," present Sandra Bullock with her MTV Generation Award. 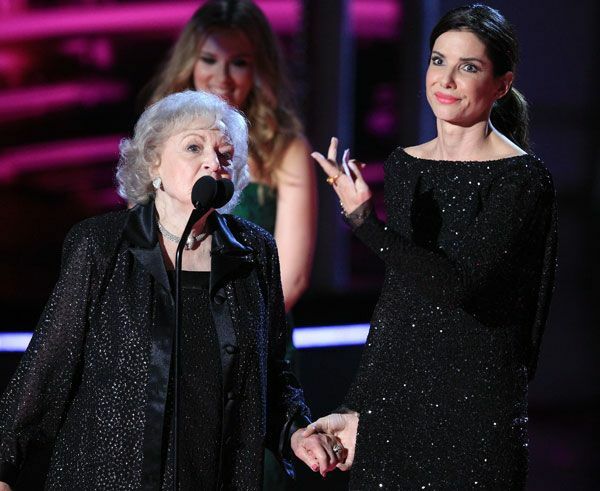 Betty White takes the mic to present Sandra Bullock with the MTV Generation Award. She says, "I'm a huge fan of yours. I've seen every one of your movies! Like 'Speed' where you played a junkie." She goes on to mix up a bunch of Sandra's roles. "Never wear that dress backwards," Betty White warns Sandra Bullock at the 2010 "MTV Movie Awards," commenting on sparkly black evening gown's revealing backside. Scarlett Johansson lets Sandra Bullock know how much she respects her work, particularly her lip-locking abilities at the 2010 "MTV Movie Awards." Scarlett Johansson admits she has nothing to say about Sandra Bullock when presenting her the MTV Generation Award -- and then later hints at wanting a kiss! Scarlett Johansson admits that she came on stage to help present Sandra Bullock with her MTV Generation because of the sensual kiss Sandra shared with her hubby Ryan Reynolds on screen in "The Proposal." Then she got her own! Scarlett Johansson looks surprised to be getting kissed by MTV Generation honoree Sandra Bullock, but she was the one who asked for it! Ken Jeong accepts his popcorn for the "WTF Award" and gets choked up making an emotional speech about his wife [two years cancer free!] being his inspiration! Mark Wahlberg and Will Ferrell chill out on some fly rigs while Tom Felton accepts his Best Villain award for "Harry Potter and the Half-Blood Prince." 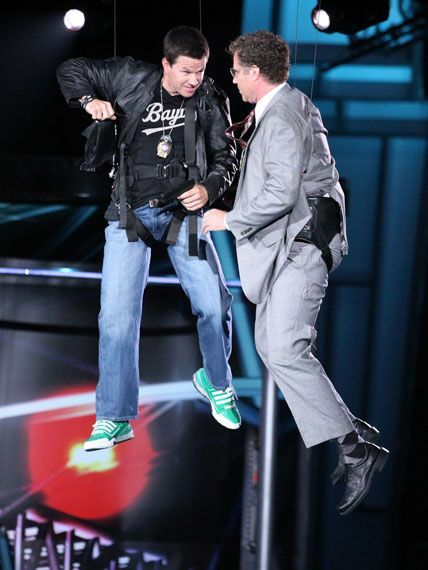 Mark Wahlberg and Will Ferrell fly in from the ceiling on wires to help present the Best Villain award at the 2010 MTV Movie Awards. Mark Wahlberg and Will Ferrell argue over their botched entrance during the 2010 "MTV Movie Awards." "Harry Potter" baddie Tom Felton looks up at Mark Wahlberg and Will Ferrell [not pictured but suspended overhead] while accepting his Best Villain award. 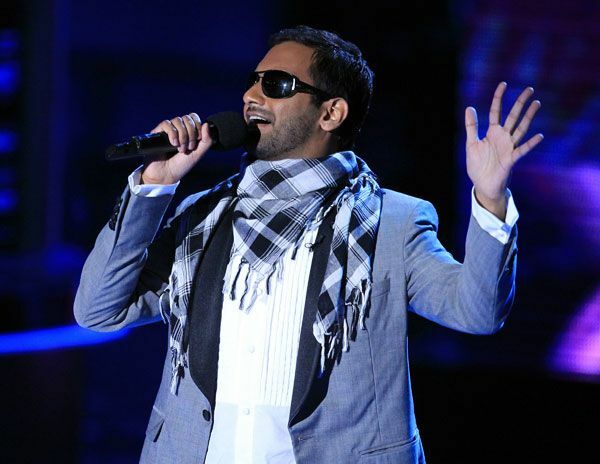 When R. Kelly is a no-show, host Aziz Ansari is forced to perform his rap about "Avatar" which ends with "F*** you, BP, thank you MTV!" Hey, how'd he get two!? 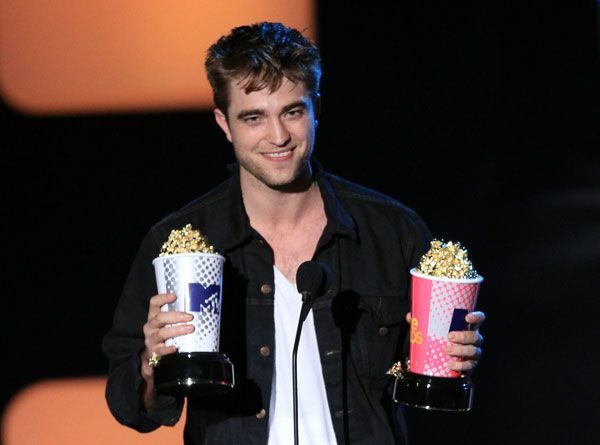 Robert Pattinson accepts his Best Male Performance award for "Twilight: New Moon" at the 2010 MTV Movie Awards. Christina Aguilera enters on a throne before performing a medley of songs from "Bionic" at the 2010 "MTV Movie Awards." Christina Aguilera shimmers in a silver bustier while performing songs from "Bionic" at the 2010 "MTV Movie Awards." Christina Aguilera wriggles her humps while performing songs from "Bionic" at the 2010 "MTV Movie Awards." Christina Aguilera carefully examines one of backup singers while performing songs from "Bionic" at the 2010 "MTV Movie Awards." Taavon, swagger coach, accepts an absent Zach Galifianakis' Best Comedic Performance award at the 2010 MTV Movie Awards. 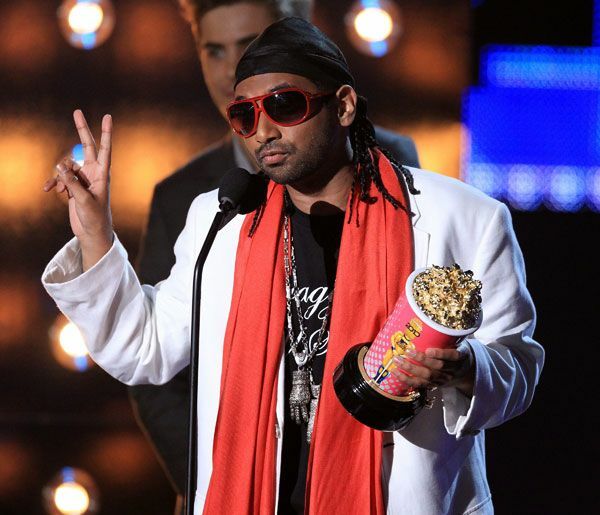 Aziz Ansari -- AHEM -- Taavon accepts the Best Comedic Performance award for his client Zach Galifianakis at the 2010 MTV Movie Awards. Peter Facinelli, who plays the patriarch of the Cullen clan, accepts the "Twilight: New Moon" award for Best Movie at the 2010 MTV Movie Awards. 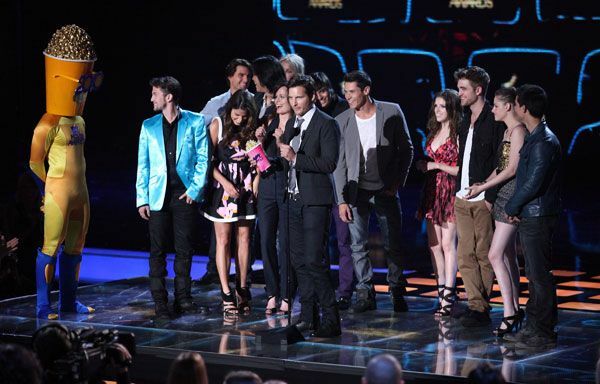 The cast of "Twilight: New Moon" accepts their award for Best Movie at the 2010 MTV Movie Awards with Peter Facinelli thanking everyone from Justin Bieber to the wonderful fans.